Edited by attorney Claybourn, this collection addresses the possibility of a shared narrative within a country divided by political polarization. “Even if searching for a common narrative risks neglecting some current or future group,” writes the editor, “we…still recognize the value of exploring whether a unifying story can be achieved and, if so, what that story might be.” The responses are all over the map, provocatively so, with some contributors stressing how this lack of a shared story and thus a shared identity has been integral to the story of America from the start. 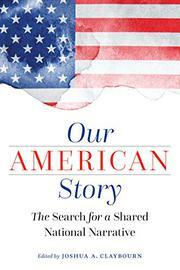 Each state had its own story, and the country prized the sovereignty of those states over any sort of federal unity. “When Thomas Jefferson talked about ‘my country,’ he meant Virginia,” writes history professor Gordon S. Wood, who proceeds to elaborate, “people were citizens of a particular state, which is what made them citizens of the United States.” That these citizens had formerly been subjects under British rule is essential to the origin story, but some citizens have long been more equal than others, and many who lived here weren’t citizens at all. So the story must encompass the plights of slaves and their descendants, the fight for equality that remains in flux. There are many mentions of “American exceptionalism,” a term that the concluding essay by Paris-based historian Cody Delistraty notes was first used by Joseph Stalin in 1929 and has since provided something of a battlefield for sparring ideologues. Yet America remains exceptional as a country founded upon an ideal, one that could well provide a unifying spirit despite the country’s deep divisions. As Cherie Harder, who served as an assistant to both George W. and Laura Bush, writes, we must “teach and learn our story.” But what story do we teach? What story do we learn? And what story do we tell? Other notable contributors include Cass Sunstein, Alan Taylor, and David Blight. A mixed-bag collection that finds the United States at a crossroads.